Some SPS corals can develop incredible pigment qualities when they are fully adapted to captive systems. Typically this can occur over multiple clonal generations via fragmentation. Successive clones become more adapted to captive conditions and can develop additional pigment qualities. One way to accelerate this process occurs when just a fragment of an imported colony is grown into a fully captive grown colony. That is precisely what Joe at Joe Knows Reefs has done with the Joe’s Mango Garden Acropora. In his case it was what we call a salvaged fragment. Basically an import colony was dieing due to shipping stress and Joe managed to save a small fragment of this coral. That is how the Mango Garden was developed. The base area and shaded areas of this coral develops a forest green fluorescent pigment. Polyps also tend to have this green. While in upper areas and areas that receive brighter light, a bright fluorescent orange pigment occurs that can even be seen in polyps. So basically you have a two faced or two color acro. Low light green and bright light orange. In addition to this the branch ends develop pink or purplish pigments that can occur on the branch stems and are very bright on corallite walls and edges. 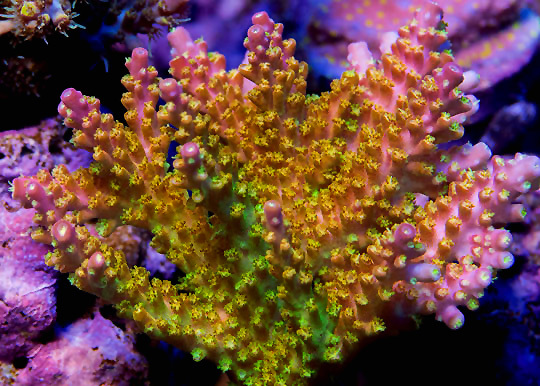 Polyps in these pink areas are mostly orange colored, but some can also retain the green pigment. It should also be noted that some polyp tentacles possess a dark colored tip. Joe has developed these qualities under strong lighting and strong water current. Reeffarmers is maintaining a seed section of this coral in a 8 foot Raceway Gyre BiZonal system. This system is naturally filtered with a semi-cryptic zone and a reef flat exposed zone. In this captive reef the coral is positioned to receive strong to moderate light and water current. The first edition fragment of this coral was sold privately. Introductory list price on December 13th 2014 was $180 for a small fragment. Greg Polec acquired the first edition fragment.